Michael and Jane Evans have turned outbuildings in the grounds of their Gloucestershire home into a gallery and exhibition centre. Whilst the premises had been used previously as part of a business, transforming them into a gallery, framing centre and tea room poses its own set of problems. However, having had to gain planning permission, research the look of the interior design and then complete the work, Pound Barn Gallery opened at Easter 2011. As they have kitted out the gallery space with STAS hanging systems, we asked them to tell us about the background to the gallery and how they started the whole thing up. The result is a completely different “case study” where framing isn’t the main feature: nevertheless the business is still all about art. Jane and Mike Evans have worked together in various family businesses for most of their professional lives. Although work itself had no direct links with the arts, Jane rekindled her interest in watercolours as a means of relaxation: she was, at the time, matron of a Nursing Home for the elderly. Unfortunately the home closed but the passion for watercolours increased: she painted more. In a moment of weakness Mike suggested he would do the framing for her. As she became more competent and confident, Jane began to accept framing work from friends in the various art clubs, to which she belongs. It was then that they made the decision to convert a stone-built outbuilding, behind the house, into a framing workshop and gallery. They have lived in their traditional, stone-built barn for 26 years. It had been converted into a 4 bedroom house, with a range of outbuildings to the side and rear. One of these was developed as a detached, two bedroom house for Mike’s parents, whilst the others were turned in to workshops: one family business running from here created luxury limousines for export to the Middle and Far East. That closed, some 10 years ago, but it’s one of these former workshops, which has now been converted to the framing workshop/gallery. Although it sounds like a simple progression, it took some while to get planning permission: in the early days the framing happened in the dining room. In fact they only opened the new premises earlier this year (2011). At the outset, the idea of the gallery section was to exhibit Jane’s work for sale, but that too has grown and they now exhibit the work of other artists. This hailed their first purchase of gallery display furniture. They opted for a STAS hanging system. First thoughts being to use it in the house and then transfer it to the gallery, but they were pleasantly surprised at how unobtrusive it was in a domestic setting. In fact, they left it in the house and bought a second batch for the gallery from DIY framing. 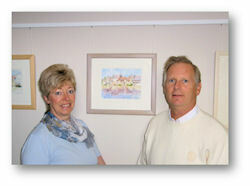 In 2010 Jane took part in the local Severn Vale Art Trail. They opened the ground floor of the house, giving exhibition space to a jeweller and 4 other artists, besides Jane. The Art Trail went very well. They had 650 visitors over 9 days, and every exhibitor sold. The design for Pound Barn Gallery grew from visits to other exhibition spaces. In one gallery they particularly liked the way it had been opened up, from ceiling to roof line, with lime washed ceiling and joists. Mike and Jane decided to create the same effect, which really suits the rustic style of their building. The walls were left as original: stone with lime pointing, painted in a neutral colour (Dulux Gentle Fawn). The floor is oak effect laminate, laid on insulation panels incorporating under-floor heating pipes. A STAS system has been fitted on all the walls and they made V-shaped, moveable display boards, also fitted with STAS, to stand out from the walls. This has both increased the hanging space and created temporary barriers between different areas of exhibition if required. They installed all of the Cliprail (white) themselves and use the perlon hangers for quick and easy ways of exhibiting artwork: in short they completed all the work in the framing workshop and gallery themselves. For the 2011 Art Trail, they succeeded in accommodating 11 artists between the house and the gallery. The weather was fantastic, Mike and Jane served tea, coffee and home-made cakes in the garden and, in the 11 days of the Art Trail, they welcomed 850 visitors and sold 45 paintings. Active marketing of the framing business, however, has been unnecessary to date; the personal contacts and word of mouth recommendations keep that side of things very busy. However it pays to have several strings to your bow. Jane’s first love remains in watercolour: an ambition for Pound Barn Gallery remains to gain a real reputation for water colour excellence. However, Mike and Jane also exhibit most media, including ceramics and sculpture. Mike is proud of the range of artists they have exhibited to date. “We do our best to create a completely new exhibition every 4 to 6 weeks, to keep it as fresh as possible for returning visitors.” The gallery has featured work by Jackie Cox, Jan Whitton and Jane Lampard, all working in pastels. Peter Cronin and Pam Kayle are water colourists who have been exhibited, as have Sue Wales and Ron Swanwick working in oils. Ceramicist, Emma Irvine and Neil Mason producing bronze sculptures, have provided 3D interest, with Chris Sinden’s lino cuts adding to the range of media on show.